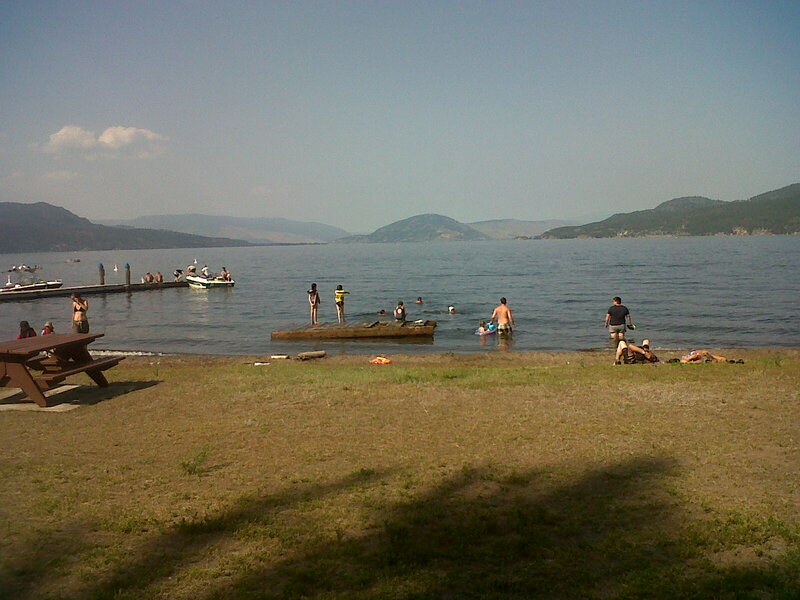 Final proper day of the tour – 135km to meet my friends camping by Lake Okanagan just north of Kelowna’s Westside. 271miles/440km since I left Whistler, the tour is over, a glass of local wine by the beach to celebrate. With pained memories of my previous long day just 3 days ago and the forecasts of temperatures well into the 30s all day I studied the ride and route profile assuming a day similar to day 1 – long and hard. As it was I had one of those special days on the bike where everything seemed to work out perfectly, the scenery was great and the miles just disappeared under the wheels making it a great end to my short tour. I shall do some roundup posts about one or two subjects when I get home, but a thoroughly enjoyable four days in a stunning country. So glad I did it. 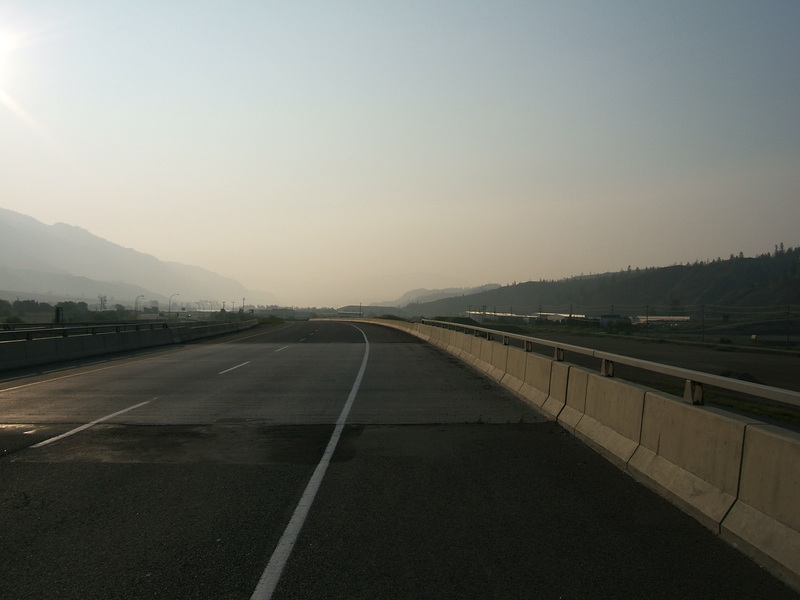 Because of the heat I was out of the motel and on the road by 6am with the intention of bowling along the valley from Kamloops to my main climb out of the valley as early as possible. Odd bit of signposting as I left the motel, the marked bike route sent me almost immediately onto the shoulder of Highway 1 where I was to spend the next 26km despite the fact that most of the way alongside the main highway were a combination of service roads and residential roads that would make a perfectly good linear cycle network all the way along the valley. However today it didn’t matter, it was early on a Saturday morning so the number of vehicles was minimal and there was no wind at all. In fact the overwhelming feeling was of a day that was going to be a scorcher. The heat haze was almost mist already down the valley and in fact it never left all day, running any prospects for good photography. The road was just gently rolling and the hard shoulder was wide and well surfaced which just invited me to get into a slightly tucked position with my forearms resting on the handlebars and my hands just gripping the cables, reminiscent of a time trial position without tri-bars. Even the knobbly tyres seemed to roll without too much drag and I polished off the first 26km to the climb really easily. This was slow and sticky, at least at the bottom, so I just tapped my way up easily, trying to conserve energy and not get too warm. But it was only a 400m climb alongside the relatively shallow gradient of a main road so it seemed to go quite quickly. The bonus was at the top when the road crested a small rise and dropped me into a beautiful green and fertile valley, just that bit cooler than the arid valley I had left. 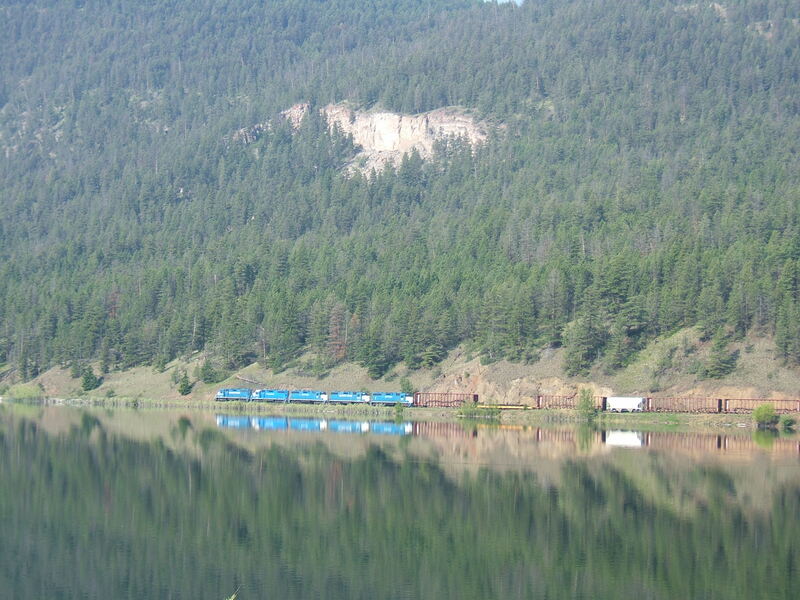 At first the bottom of the valley was a flat area of grasslands and reeds fed by a steam, then the attractive Monte Lake with fishermen’s boats and a spectacular railway track hugging the far shore. 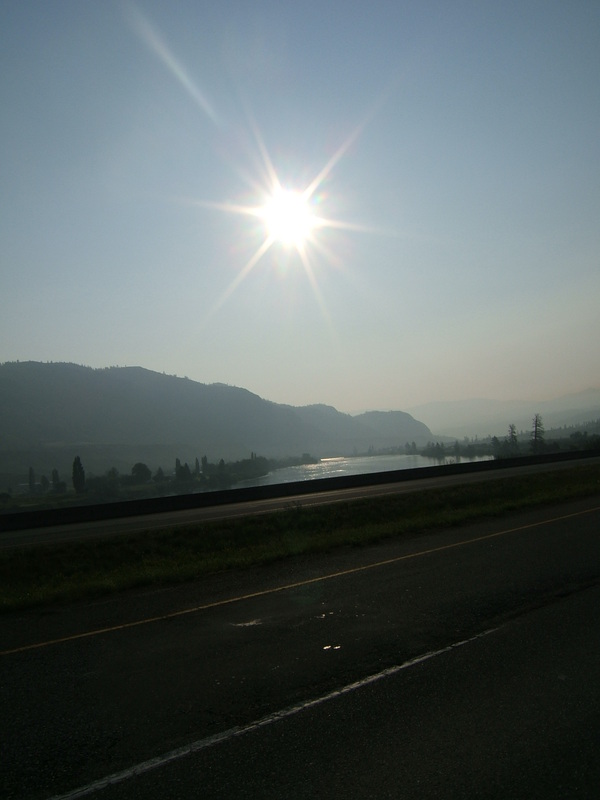 After the lake the valley opened out onto a pancake flat area of farms, many of them with sprinklers going flat out and my first signs of the famous Okanagan fruit crops with cherries for sale by the road. Once again this road was so flat and inviting I ignored all the temptations to stop and just lay gently on my handlebars while bowling along at a really good pace. In my mind’s eye I could see those days in the Tour de France when the peleton has 200km or more to ride across the baking plains of the Vendee and the teams send the “rouleurs” to the front to just eat up the kilometres at a steady pace. Nothing like the same pace on my laden steed but the feeling of just knocking off the miles quickly was enjoyment in itself. At the end of the open valley section the surrounding hills suddenly closed in to form a narrow V and I was descending again towards my chosen mid ride break at Falkland. Nearly 50 miles/80km achieved over an hour ahead of plan so I treated myself to a breakfast and home-cooked blueberry pie just to celebrate. 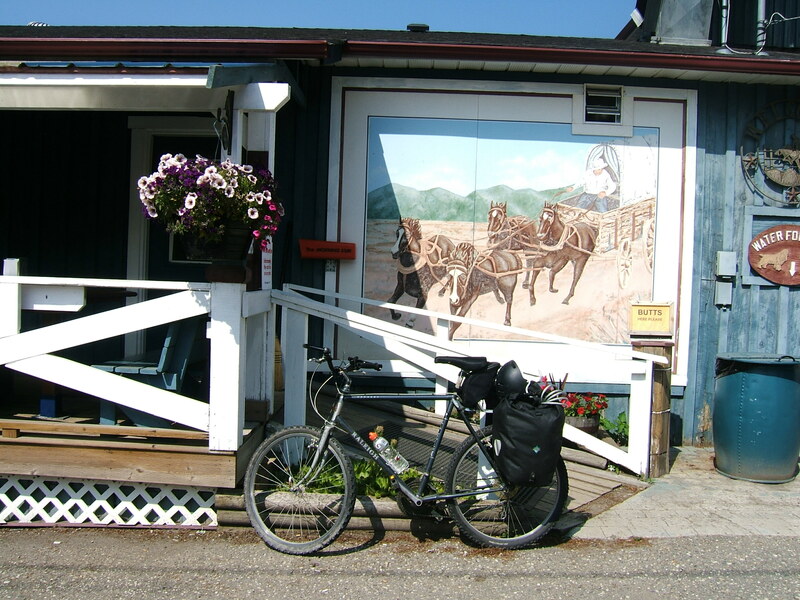 I chose the rather twee café which looked like an English tea room because I liked the seat on the terrace, but I don’t know anywhere at home that also has a mural of their “Stampede” on the wall, the Falkland Stampede being the town’s biggest event of the year. I guess we would understand it as a rodeo, but I gather the rodeo is just one of the events in a celebration of all things cowboy and country. 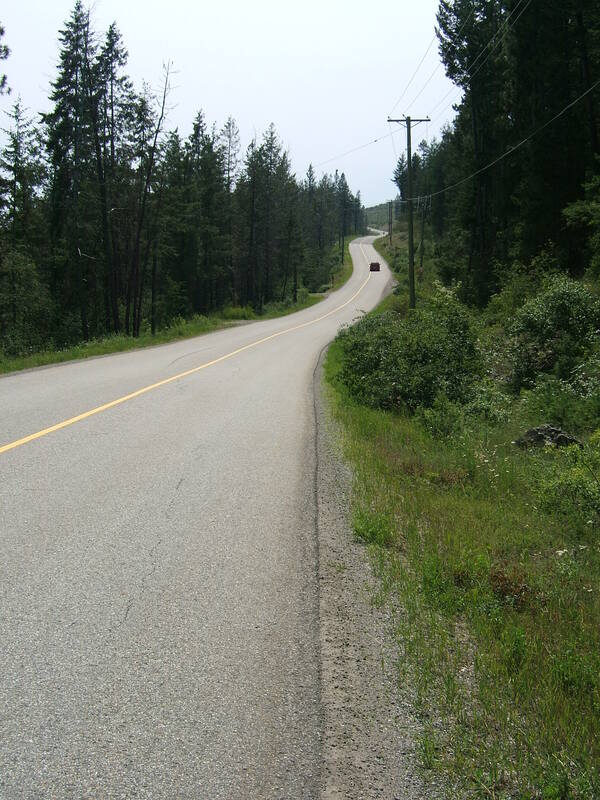 From Falkland the road then descended at varying gradients for almost another 30km until I emerged into the north end of the Okanagan valley which features a lake 135km long. 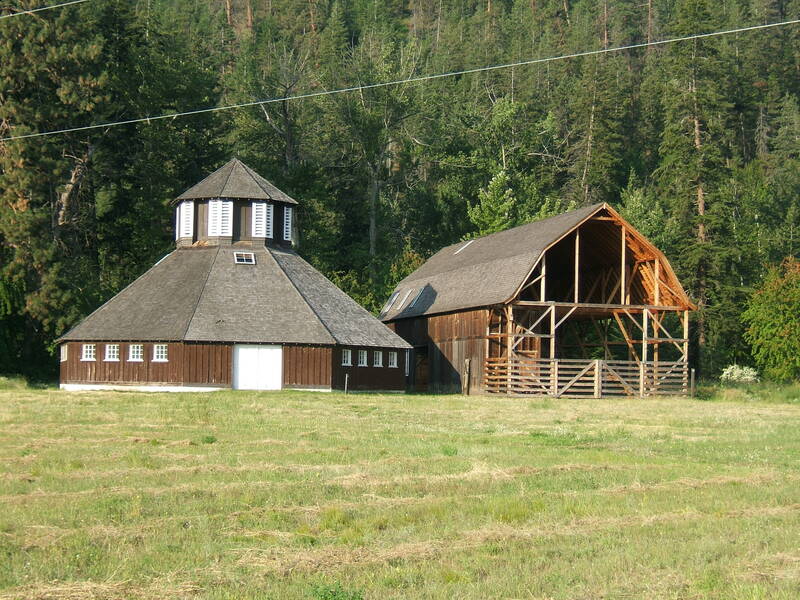 The valley is the home of a busy tourism industry, British Columbia’s wine growing and fertile farming district. 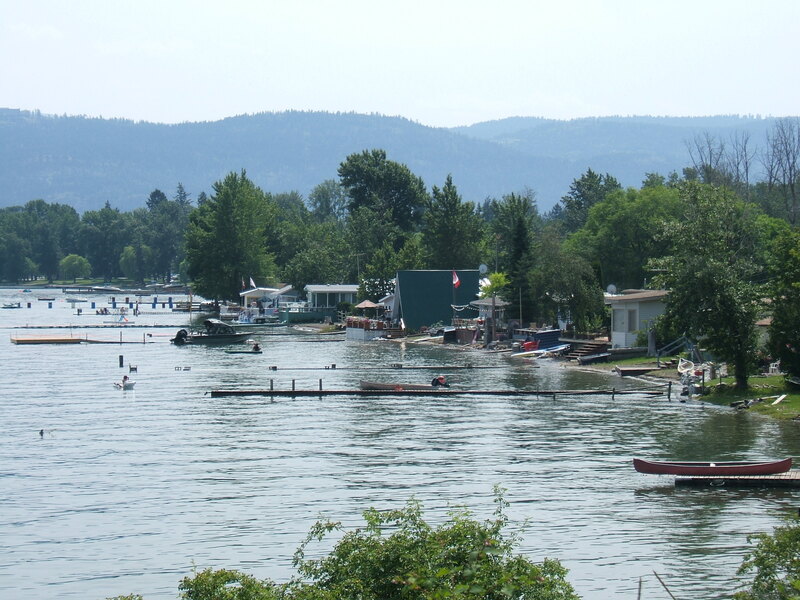 My destination was ultimately Kelowna but my friends from the city were camping at Fintry, some 30km north of the city on the west side of the lake so I was able to turn down the quiet West Side Drive to complete my trip. I was feeling so pleased with myself I initially tried to slipstream two road cyclists on skinny lightweights as they came past but that idea lasted no more than a few metres of downhill before I was gasping for breath and my legs reminded me that this was day 4. The road offered regular views over the lake and the houses in amazing settings, but it also meant that the ride finished with some stiff climbs up and around the headlands. I was pleased I didn’t have to do any seriously big climbs, by now it was 1.30, the heat was stifling and the tarmac was melting on the road. 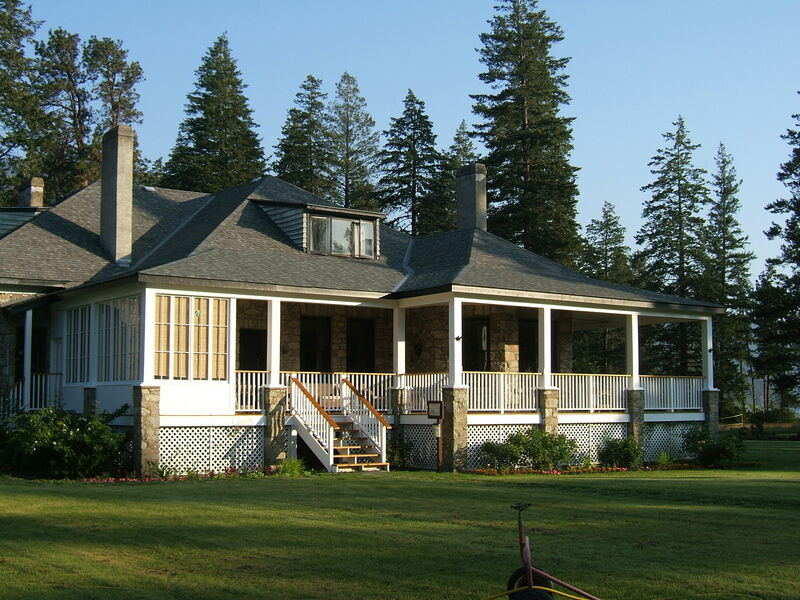 Fintry was a delight, the former property of a rich Scottish man who had inherited some wealth and used it to escape to Canada and try to build a model farm on the banks of the lake almost 100 years ago. Today the old house is a museum and the area is mostly a delightful family camping ground by the lake where I was able to relax and have an afternoon snooze after a refreshing glass of white. I even justified carrying a can of extra strong insect spray all the way from Whistler – the only downside of the location! 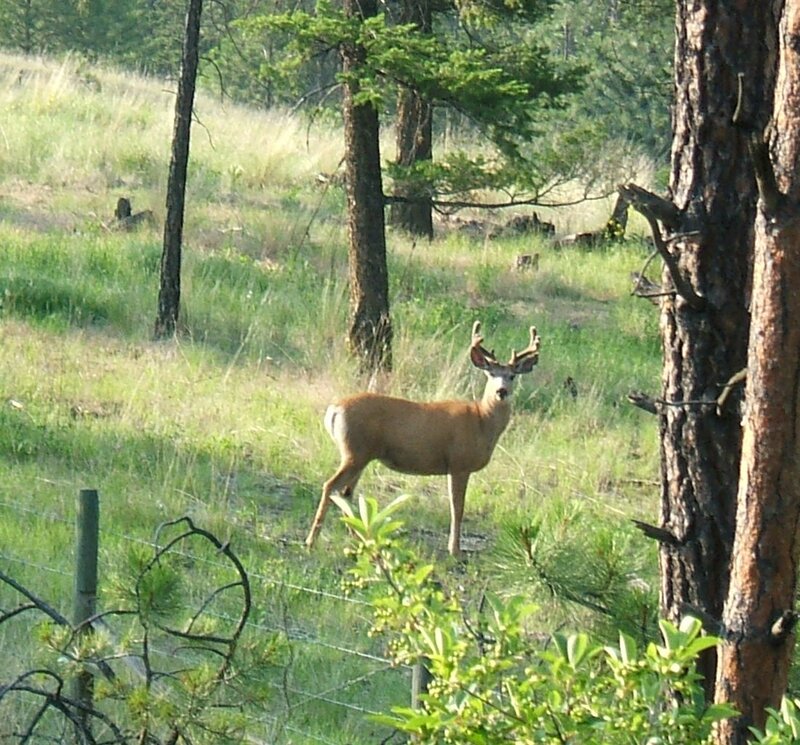 This entry was posted in Countries, Travel and tagged British Columbia, canada, cycling, Fintry, Kamloops, Kelowna, Touring, Visits by kevinmayne. Bookmark the permalink. Thanks for this. I’ve done this route years ago, but in the car, I’m afraid. Even stayed in Kamloops, which we loved for the name alone. If had been with the family I would have been driving too, this holiday was a bit of a rare treat.